Maclennan specialise in the installation of applied external systems and sprayed systems. External tanking is the provision of a waterproof membrane to the outside of the basement or sub-structure in accordance with BS8102: 2009 (Type A form of construction). When selecting a suitable external tanking system. External waterproofing guarantees are of little value even if supported by GPI. In the event of a failure there will inevitably be split responsibility. The contractor will always blame back filling, damage by others etc. They will insist that the leak is identified before liability is accepted and this is often not possible. For this reason we always install a cavity drain in our designs when waterproofing a basement. Consideration should be given to the form of construction, ground water levels, ground drainage, soil type and ground contamination. There are many forms of external waterproofing including sheet membranes, pre applied membranes liquid systems, spray applied elastomeric systems and cementitious systems. 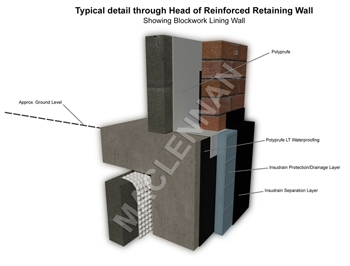 Maclennan will only ever design and install a system that is fit for purpose. Type A system’s must always have a suitable external land drain, to remove water pressure from the structure. If this cannot be accommodated, then we would only install a external system as part of a dual system which includes cavity drainage. All land drains must be fully serviceable. -External Grace Bituthene Waterproofing Membrane. -Showing Head Of Blockwork Reinforced Retaining Wall. - Selecting a suitable external tanking system. -Showing section through head of wall. We are often asked by our customers to help in the design of an external waterproofing system and have found that in most occasions >we have to include cavity drainage in the design to comply with BS8102 an to provide form and feasibility of repair in the event of leakage. External waterproofing is only really an option in new build construction, and even then, a complete system to both the walls and floor should be used. However, in many cases the floor slab/raft has already been constructed making external waterproofing problematic. If external waterproofing is being considered, the removal of ground water by the use of serviceable french drains/land drains should be incorporated into the design. Removal of water from the structure is a method of complying with BS 8102 which states that the designer should assume that less than adequate workmanship will have been employed during the installation of the waterproofing. Removal of water to prevent a build up against structure means that the structure and its waterproofing will not be tested. However, the lifespan of the water removal system is finite and can be problematic and asks too many unanswered questions. It is not possible to ascertain exactly how much water will need to be removed to prevent a build up of water pressure against the structure. In many cases watercourses are arriving at the structure from many miles around and it is possible to be in a scenario where you are trying to remove unlimited sources of water. This can create an enormous strain on the system, especially where pumps are used to remove the water.